Open House – Apex Executive Home for Sale! 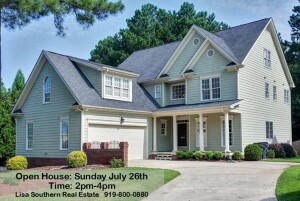 Lisa Southern Real Estate is excited to host this Open House this Sunday July 26th from 2pm – 4pm! Are you thinking of buying a home in Apex, North Carolina? Stop by this open house and take a tour! Click on the photo below for more information on this home! Gorgeous Executive Home On A Cul-de-sac Lot In Abbington! Hardwood Floors Throughout Almost The Entire Home! Beautiful Kitchen With Granite Countertops, Stainless Steel Appliances, Pantry, Upgraded Cabinetry & Tile Backsplash. Large Master Suite With Fireplace & Updated Bathroom. Second Floor Bonus Room. HUGE Unfinished Walk-Up Attic. Private Fully Fenced Backyard. Large Deck & Patio Perfect For Relaxing/Entertaining. Ideal Location! Easy Access To Major Rds. Close To Shopping & Restaurants! Stop by on Sunday July 26th from 2pm – 4pm to take a tour of this home! Take a Tour of This Harmony Home! Lisa Southern Real Estate is proud to hold this Harmony home open for tours this Sunday July 26th from 2pm – 4pm! Are you thinking of buying a home in Cary, North Carolina? Stop by this gorgeous home on a cul-de-sac and see if you will be living in Harmony! Click on the photo below for more information on this home! 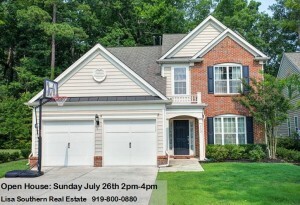 Gorgeous Home On A Cul-de-sac Lot In Sought After Harmony Neighborhood In Cary! Large, Open Floor Plan With Wood Floors Throughout Main Level. Family Room Features Gas Fireplace & Custom Built Entertainment Set Up. Separate Breakfast Room & Dining Room. Beautiful Kitchen With Corian Countertops, Island, 4 Burner Gas Cooktop, Stainless Steel Appliances & Upgraded Cabinetry. French Doors Lead To 1st Floor Office. Large Bedrooms With Extra Storage. Beautiful, Private Wooded Backyard & Deck For Entertaining! Great Location!